Music and sound-design for the short movie Tape is made from trees by Luna Maurer & Roel Wouters. The movie is made in accordance with the Conditional Design Manifesto. At the CASZUIDAS	Urban Screen Festival 2009 in Amsterdam (NL). The movie as well as the music is made following a set of instructions. -Tape an orange line ortogonal to the end of a branch, its length is one third of the branch. 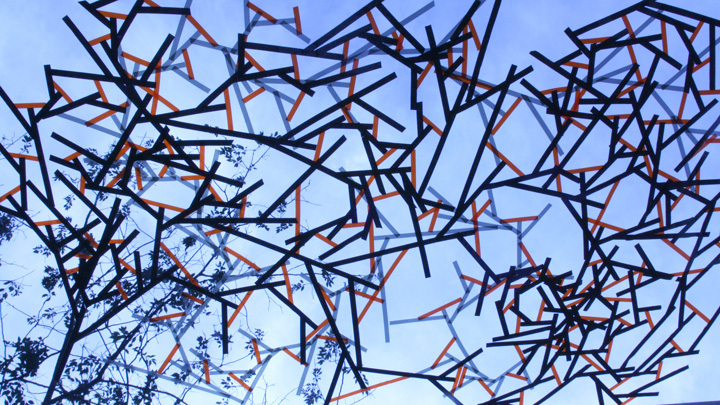 - New branches emerge from the middle of a branch segment, and touch the orange line at its end points. - The length of the branch is double the distance from its origin to the orange intersection. - Now repeat the same steps. - Each new tape triggers a new note. - The longer the tape, the longer the duration. - Of each set of three tapes (one orange and two following black tapes) the last tape/note has a duration four times as long. - The higher the generation of the tape/branch, the shorter the duration. - The pitch is taken from a chord from the jazz standard Every time we say goodbye, starting with the first chord. - A next chord is used whenever a branch is added far away from the previous added branch. - The velocity of the note depends solely on the length of the tape. Fotos of the making of the video here.